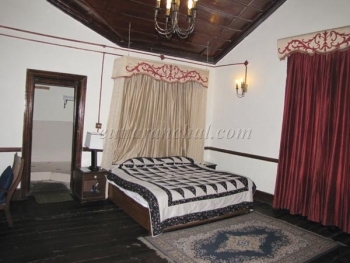 Chevron Rosemount is a popular heritage hotel in Ranikhet built in 1900 AD, which reminds of the British era. The hotel was once a colonial bungalow of the Britishers, and its age is more than 100 years. The hotel is built in Kumaoni style with stone walls, wooden floor and high wooden ceilings. The hotel has dark wood furniture, tall windows and the reception is wood paneled with large mirrors and wall paintings. The incredibly spacious rooms of Ranikhet Chevron Rosemount provide princely feeling to the guest with its intricate wooden work and world class amenities. All the rooms have attached spacious bathrooms. From October to March the scenic vistas of Himalayas stretching in 180 degree arc covering can be easily seen. 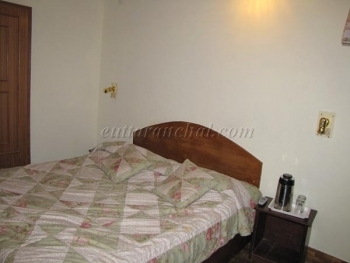 Chevron Rosemount is located in the peaceful Cantonment area, 4 kms from the Ranikhet bus stand. Chevron Hotels believes in quality rather than quantity, i.e. the reason why it serves only 11 rooms even though covering a large area. The hotel offers 11 luxurious, well maintained and incredibly spacious rooms, classified as Cottage, Pine View Deluxe Room, and Nirvana Suite. All the rooms of Chevron Rosemount are well equipped with top-notch amenities for the paramount comfort of the guests. The rooms have been gracefully designed with wooden interiors. The Restaurant of Chevron Rosemount serves scrumptious food and various beverages. Hotel Chevron Rosemount welcomes visitors with an inimitable dining experience. The decor of the restaurant will take you back to the Victorian period. There are antiquated china pieces and biblical paintings in the restaurant. Enjoy the delicious multi-cuisine at Chevron Rosmemount Restaurant and drink beverages while appraising the beauteousness of Himalayas. Play indoor and outdoor games in the Chevron Rosemount hotel with your loved ones. Take small jungle walks under the shed of pine trees and talk to the localites in order to know more about the place. Meditate in the garden of the hotel. Enjoy bonfires during night and you can have roasted chestnuts along with them. Chevron Hotel also organizes hosts of different activities like horse riding, trekking, rock climbing, golfing etc. Plan a stay at Chevron Rosemount to make your special time even more special. Hotel Chevron Rosemount is located in Ranikhet, only 7-8 hours by road from Delhi or a comfortable overnight journey to Kathgodam (the nearest railhead) by train and there after only 90 minutes drive by road. Nainital 60 kms, Kathgodam is 85 kms, Corbett National Park is 75 kms, Almora is 50 kms, Kausani is 80 kms and Delhi 325 kms from Chevron Rosemount.